With a package to suit almost anyone, great fishing and fun guides will make your day special. 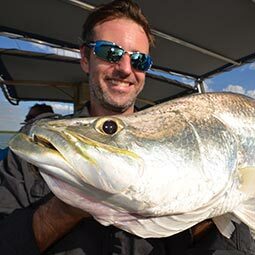 Reknown Fishing Charters in Darwin in the Northern Territory as featured on TV! An Experience You'll Never Forget!! 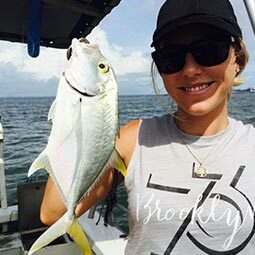 Darwin is the gateway to some of the worlds greatest species of fish, so get a taste of Darwin and come catch your own fish with Darwin Harbour Fishing Charters. Every type of angler and every type of fishing experience is catered for. Even mud crabbing can be done when the tides are right without too much interference to keep fishing at the same time. 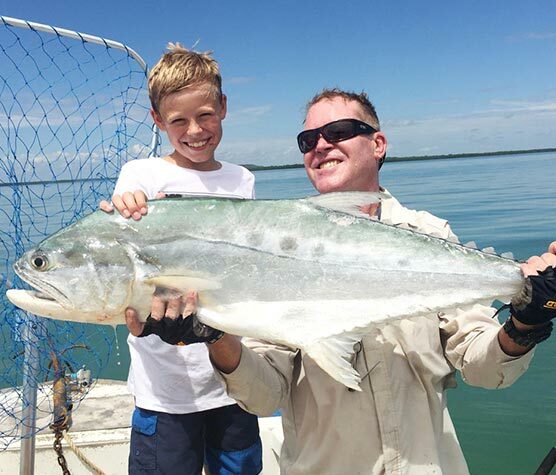 On the picturesque waters of Darwin Harbour your qualified guide will assist you with everything from baiting your hook to filleting your fish to take home. You will be comfortable on board our sturdy boats with walk around deck, shade canopy and fully surveyed. Our most popular package! With good reason – half a day of full on fishing at affordable rates. 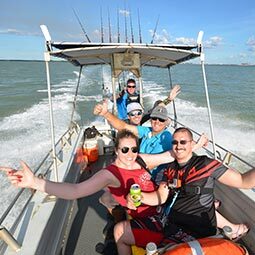 Our short travel times ensure you get maximum actual fishing time all over Darwin Harbour. For those where half a day just won’t do, we offer a serious upgrade with great value. 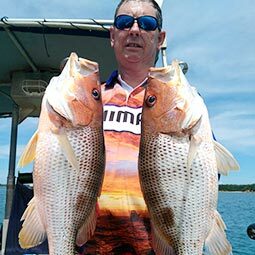 Over the course of the day you will fish many different locations in and around the Darwin harbour. Lunch is provided at the restaurant. Our second most popular package! Catch the iconic Territory Barra. Season three of Million Dollar Fish is just about to start and last year 50% of the prized fish were caught in Darwin Harbour. You have to be in it to win it! An unforgettable time with the whole family! This is sure to create family bonding time. Two more spots are available to book if you have more members of the family or friends wanting to join you. An amazing fishing experience with all your friends or just by yourself! This package is also great for businesses, corporations or even work colleagues. Take up to 8 people and enjoy the day together on your sole charter. Take up to 8 mates for a massive days fishing on our full day sole charter or just go by yourself! This allows your group to relax and have a great time, joke and bragging over the best catch of the day! Lunch is provided at the restaurant. On our Full Day Charters we provide lunch at Fusion on the Wharf. 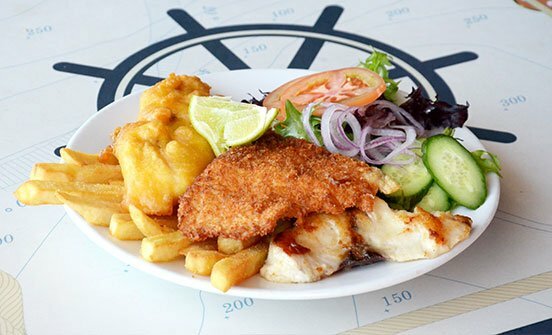 They cook up your catch any way you want either fried, battered or grilled and serve it with fresh salad and chips. For all Half Day Charters, the chef at Fusion is happy to cook up your catch for $12.00 per person – This is great if you don’t have the means to cook your catch at home. They are licensed so you can have a beer or treat yourself to one of their cocktails. Fusion on the Wharf is located in the Starboard Arcade on Stokes Hill Wharf. Its open 7 days for lunch and dinner in a warm welcoming atmosphere. Experience Darwin Harbours panoramic views and magical sunsets all year round while you’re enjoying your meal. The ultimate Barramundi Experience at Corroboree Billabong, an hour and a half hour drive from Darwin. 4 hours of Barra fishing! While chasing the Top End Barra you can also expect to see Lotus Lilies in bloom and a wide variety of Water birds, Sea Eagles, Crocodiles, Water Buffalo and Wild Pigs. The ultimate Barramundi Experience at Corroboree Billabong, an hour and a half hour drive from Darwin. 6 hours of Barra fishing! While chasing the Top End Barra you can also expect to see Lotus Lilies in bloom and a wide variety of Water birds, Sea Eagles, Crocodiles, Water Buffalo and Wild Pigs. It’s YOUR TURN to catch the Million Dollar Fish! Last year 50% of the prized fish were caught in Darwin Harbour! 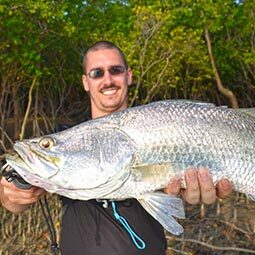 Come catch the iconic Territory Barra with Darwin Harbour Fishing Charters and you could WIN even more! 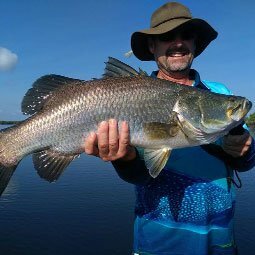 We have a half day barra charter available around the Darwin Harbour or jump on the full day barra charter at Corroboree Billabong. If you catch a tagged Barra with us we will refund you your trip in full. Does this sound great to you? The odds of catching the $1M barra have never been better! The $1M tagged fish from Seasons 1, 2 and 3 have been reactivated for Season 4. 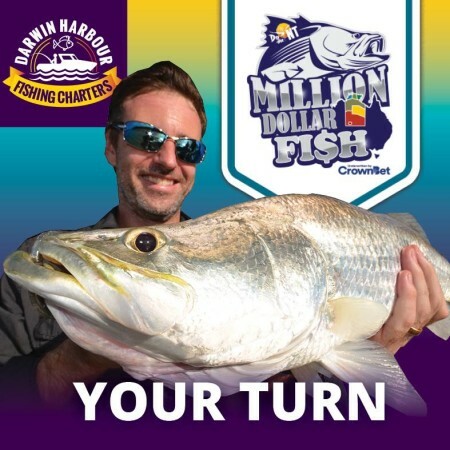 With another two Season 4 $1M tagged fish we are providing five chances to catch the million dollars! There also are 100 fish worth $10,000 each and a special new category of 20 fish, with purple tags, worth $2,500 cash to the angler plus $2,500 to a Territory-based charity. Darwin Harbour is both beautiful and unique. It has an incredibly diverse range of fish and also a large tidal range. Our custom built boats allow you to fish the harbour no matter what tide. 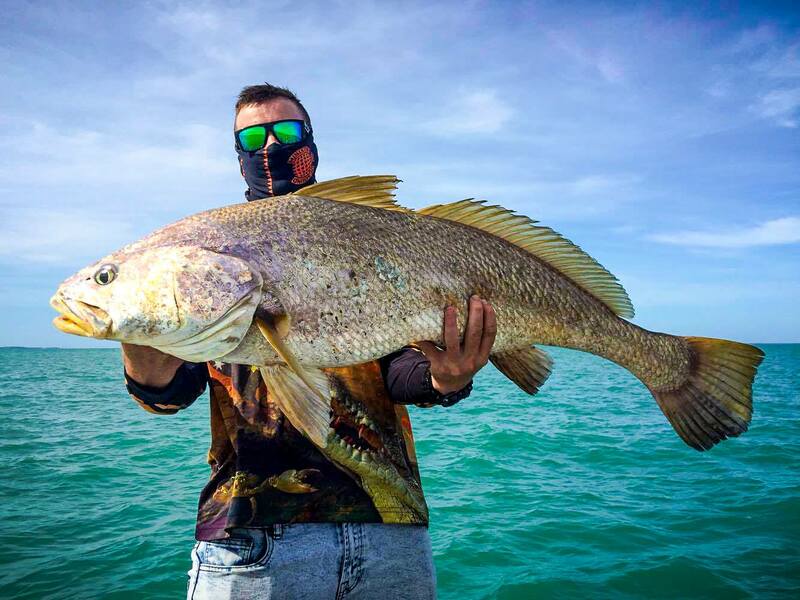 We can access estuaries, mud flats, mangroves, reefs and wrecks ensuring a memorable days fishing on our charters. Having 415 different species of known fish Darwin Harbour has an incredibly high diverse fishery. Darwin Harbour provides the unique opportunity to see dolphins green turtles and possibly even a Dugong! Consisting of ria shorelines and headlands Darwin Harbour is a drowned river valley! 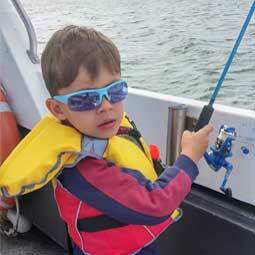 We love what we do – We love to fish! Our custom built boats for fishing Darwin harbour allows us to fish all tides. We can access estuaries, mud flats, mangroves, reefs, wrecks and live baiting while ensuring your comfort and safety to deliver the experience of a lifetime. 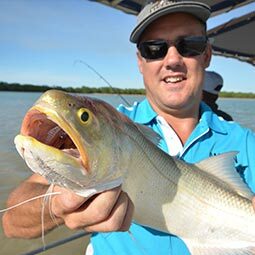 Our team has over 25 years fishing experience around Darwin Harbour and will ensure a great fishing adventure. Your guide will gladly clean, gut and prepare your fish to take home for you ready to enjoy. All our vessels are regularly maintained and full safety equipment is always kept on-board. We strictly adhere to NT fishing bag limits and encourage a catch and release policy for anglers not able to keep their catch.